A 16,000-mile journey to raise awareness about blindness and the abilities of the visually impaired. We can’t believe that the end of Phase II is here and that the ride is starting! It seems so long ago that we were dreaming about this trip, but now it’s here. Everything is ready and so it’s just a matter of days before we step foot onto the South American continent and start moving north. 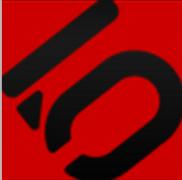 Phase I was primarily kicking off the project and developing the infrastructure to share our adventures online. Phase II focused on finalizing preparations for the ride and gathering the necessary gear and items to spend the next 18 months on the road. It looks like we will start riding up the Americas around December 19th. 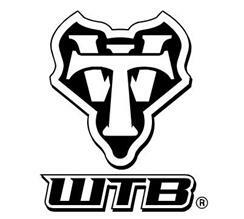 Follow our adventures at twoblindtoride.org. 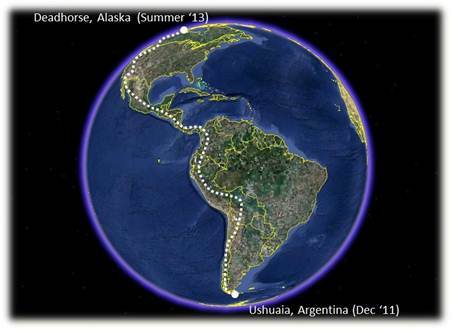 In Phase I’s summary, we contemplated various lower-cost options of flying down to Ushuaia. As convenient as flying straight to Ushuaia would be, its high cost made us look for alternatives. In looking around, we found that flying to Buenos Aires and then to Ushuaia saves a couple hundred dollars, and this would allow us to spend some time in Buenos Aires—a bonus! Our flight from Phoenix, Arizona to Buenos Aires, Argentina is on December 6th. We’ll spend a week there, perhaps crossing over to Uruguay next door for a couple of days, before flying down to Ushuaia on December 14th. This means we’ll be at the end of the world on the 14th and so it’ll only be a matter of days before we start riding up. At the moment, we only have an idea of how we’re going to move northward—that is, ride north, cross into Chile to Punta Arenas, continue north to see Torres del Paine National Park, then onward to El Chalten. Step by step to tackle 16,000 miles. Once in Argentina, we’ll get a map and figure out which roads and highways to take. The rest of the way will unfold as we move along. Part of the adventure is the unknown and the surprises that come with it. Stage 1 is north-bound to Saniago: ~1,800 miles with ETA ~end-March 2012. Riding across the country during the summer of 2009 allowed us to “go minimal.” That is, we carried very little because it was warm and there were many towns sprinkled along the way to pick up whatever we needed. This kept weight in the panniers down to a minimum. We didn’t even carry rain gear! Just about everything we’ll be bringing along for the ride. Loaded at ~145 lbs and 11 ½ feet long. 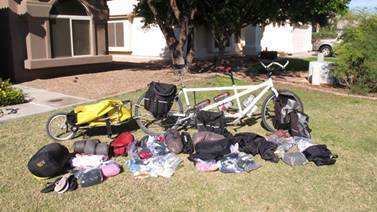 The total weight for the bike and gear will be roughly 155 pounds once we include provisions enough for up to seven days. Flat ground will be greatly appreciated, and downhill’s will be fun. As noted in Article #3 Riding in Tandem, we have a front disc brake that acts as a drag brake. It will come in handy on those long and/or steep descents where the weight of two people and a fully loaded tandem bike will propel us like a rocket down the mountain. As for uphill’s, they will be difficult. We’ll pedal as much as we can, but we also have no shame in walking the bike to get over a pass. 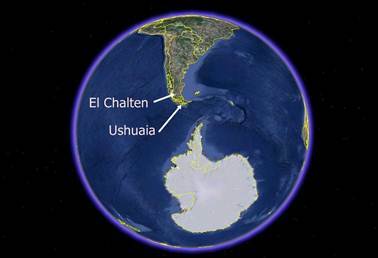 For the full length of the Americas, it is estimated that the total elevation gain is 1.6 million feet. That’s about 40 Mt. Everest’s! We continue to gain momentum in sharing our story to raise awareness about blindness and the abilities of the visually impaired. 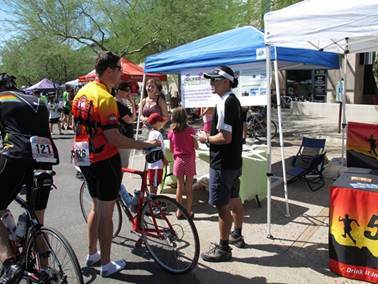 2B2R had an exhibit at the 2011 Scottsdale Cycling Festival where we talked to people about our upcoming trip. The festival drew roughly 2500 people from the local Arizona cycling community. The 2B2R banner made for the Scottsdale Cycling Festival in Scottsdale, AZ. 2B2R business card front and back. Overall, the event was a success in that we talked to a lot of people and “opened their eyes” to the visually disabled community. We share our the Americas 2012-13 ride. Phase II’s goal for raising awareness was to cumulatively reach approximately 600 people. 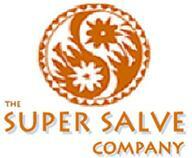 We have exceeded this goal since getting 2B2R business cards. These handy cards are a great way to reach out to people and to share our story: how a legally blind couple will attempt to ride the full length of the Americas without any sighted-person’s guidance or assistance. Our goal by the end of the trip is to reach 10,000 people. A long cycle touring trip like the one we’re about to embark on doesn’t require that much pre-training. As you can imagine, the first month of riding can be considered as “training” for the remaining 17 months. 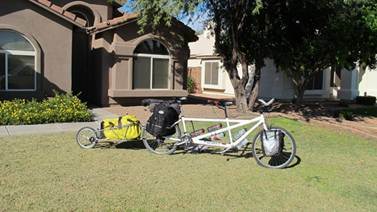 We did, however, do a ride around the Phoenix area to test out what it felt like to pull a trailer. En route to nearby Gila Bend, AZ for the night. (See Oct 24th and 27th. Stage 1 will start in mid-December (original plan was beg-January 2012). We estimate that it’ll take about three months to ride the ~1800 miles to Santiago, Chile. As a note, we averaged about 1500 miles a month when we rode across America in 2009; therefore, three months for 1800 miles should have adequate buffer to take it easy, enjoy the experience, soak in the scenery, and manage the varying weather conditions. Stage 1, like the rest of the stages, will be primarily to ride and to raise awareness. 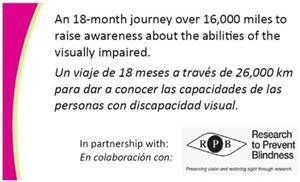 In Partnership with RPB to raise awareness about blindness. 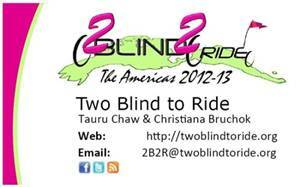 Join us as we ride the Americas and help us raise awareness about blindness and the abilities of the blind.